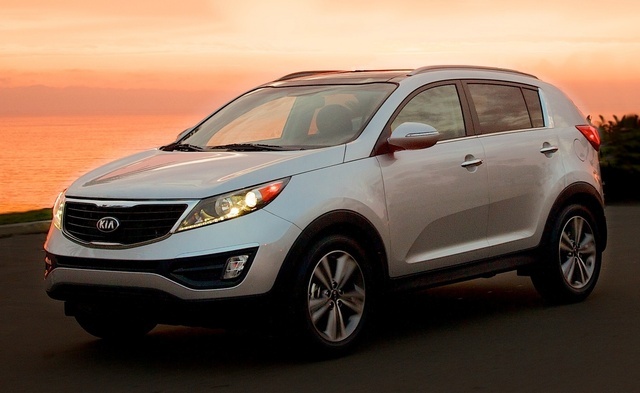 CarGurus has 20,759 nationwide Sportage listings starting at $1,795. A turbocharged 2.0-liter 4-cylinder engine is standard for the Sportage SX, one of the most powerful engines you can get in a compact crossover SUV at any price. Although its design and engineering date to 2011, the Kia Sportage has aged exceptionally well and remains a compelling choice among compact crossover SUVs. Stylish, practical, and affordable, the Sportage will be an even better deal in the months to come, as Kia readies a replacement. There is, however, a single downside to Sportage ownership, and it relates to safety. Kia has already introduced the redesigned 2017 Sportage, showing the new model at the 2015 Frankfurt Motor Show. Based on European specifications, the new Sportage will share the same platform and likely the same powertrains as the new 2016 Hyundai Tucson that recently went on sale in the U.S., which I’ve already reviewed for Car Gurus. Extrapolate, and it's easy to conclude that the next Sportage will be larger inside, more technologically sophisticated, safer, and more fuel-efficient. 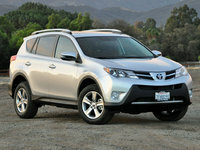 Some people have also commented that the new front styling resembles that of the old Subaru Tribeca. That is not a compliment. Between now and when that new 2017 Sportage goes on sale, you can buy the outgoing model, which suffers a single major flaw that makes it hard to recommend, a safety-related issue associated with crash-test performance. Whether you shop for a leftover 2015 or a 2016 model, three trim levels are available: LX, EX, and SX. My Sportage SX test vehicle was a 2015 model, but for 2016 the only change, aside from a reduced number of colors (Signal Red is cancelled, for example), is that the Luxury option package is standard rather than optional for the SX model and effectively costs less than it did in 2015. To account for this, the deals are slightly sweeter for the leftover 2015 models, by just enough to make either model year vehicle about the same price. No matter which model year you shop, or which trim level best fits your budget, you’re getting a good-looking little compact crossover SUV. Equipped with seating for 5 people, the Sportage is quite stylish and certainly does not look its age. The SX is the sporty version, equipped with trendy 18-inch aluminum wheels with a machined-face finish and black painted spoke pockets. The Sportage’s role as an entry-level, mainstream SUV is evident only in the quality of the plastics used to panel just about everything within the cabin. Sheen is subdued, but the top-of-the-line SX model really ought to have nicer materials. In this respect, the Sportage’s design most obviously demonstrates a need for improvement. A turbocharged 2.0-liter 4-cylinder engine is standard for the Sportage SX. It is one of the most powerful engines that you can get in a compact crossover SUV at any price. Peak horsepower measures 260 at 6,000 rpm, and the engine makes 269 lb-ft of torque from 1,850 to 3,000 rpm. While that power spread isn’t as broad as what you’d coax from an Audi or Volkswagen 2.0-liter turbo, this kind of power in any 3,433-pound vehicle is impressive. Turbo lag isn’t really an issue here, and while the engine doesn’t quite “whoosh” or “zing” the Sportage to speed, this is a fast little sport-ute. A 6-speed automatic transmission powers the front wheels, unless you opt for the all-wheel-drive (AWD) system. Then, power is distributed to all 4 wheels, and Kia even supplies an AWD Lock feature for an even power split at lower speeds. The automatic is a far more satisfying transmission than the new dual-clutch gearbox in the redesigned Hyundai Tucson, though fuel economy simply is not one of the benefits of choosing a Sportage SX. The official EPA rating for a Sportage SX with AWD is 21 mpg in combined driving, and I got 22 mpg on my 70-mile test loop. That’s a good sign that EPA numbers are accurate, but a much larger Honda Pilot with a more powerful V6 engine is almost as efficient. Entertaining to drive, the Sportage feels solid on the road, providing a better ride quality than the new Tucson, one with less bounce and chop on imperfect pavement. The Sportage takes corners with eagerness, displaying limited body roll, and the brake pedal feels firm, responsive, and natural underfoot. Kia could improve the Sportage’s electric steering, though it is gratefully free of the driver-selected FlexSteer technology used to almost no benefit in other Kia models. In the Sportage, the steering lacks response, precision, and feedback. On center, though, it doesn’t feel loose and disconnected, so it has that going for it. 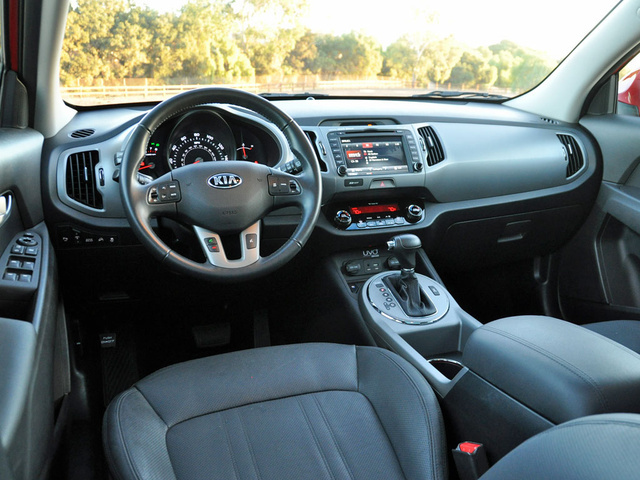 Kia tries to disguise the inexpensive materials used within the Sportage’s cabin with mixed results. The soft material on the upper portions of the front door panels and the armrests are convincing, the mesh headliner is an upscale touch, and the controls operate with a sense of refinement. Unfortunately, the hard plastic coating the bottom half of the interior and the backs of the front seats, the expanse of gray plastic on the dashboard, and the cheap-feeling leather all remind the driver of this crossover’s modest market position. It sure didn’t help that with each right turn and accompanying brace of my left leg on the driver’s door panel, the door panel creaked under the pressure. Controls feature a mostly logical layout with clear markings. Kia employs large buttons and knobs for commonly used functions, meaning that the driver’s interaction with the Your Voice (UVO) infotainment screen is fairly limited. The main sources of aggravation are associated with referencing outside temperature and time. Cycle through the trip-computer screens to find the outside temperature, and remember to check different locations on the UVO display for the clock, depending on whether you’ve got the radio or the navigation screen showing. 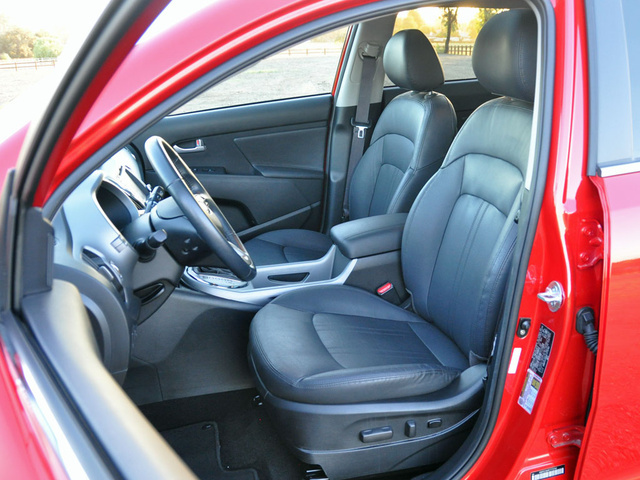 The driver’s seat is comfortable, offering a wide range of adjustment, and my test vehicle’s front seats were heated and ventilated. The front passenger’s seat lacks a height adjuster, which is usually a deal-breaker at my house, because my wife hates to feel like she’s sitting on the floor. 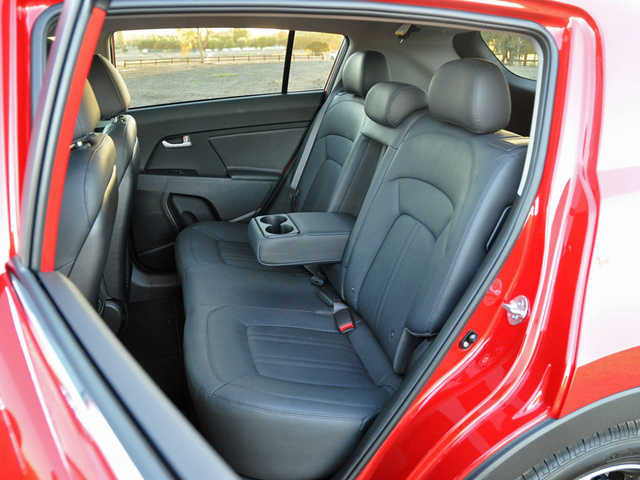 Rear seating is roomier and more comfortable than expected, the generous legroom coming at a loss of cargo space. My kids had plenty of room and certainly enjoyed the view of rare Southern California storm clouds through the panoramic sunroof. Adults will want to be sure they’re not leaning forward when opening the Sportage’s rear doors, because the frames are at their widest point right at the upper corner; I almost whacked myself in the face the first time I opened the door to help my youngest daughter unbuckle her car-seat straps. Cargo space is not what one might call generous, though we had no trouble packing the Sportage full after a big-box retailer run. Behind the rear seats, this Kia supplies 26.1 cubic feet of cargo room. Fold the seats down, and you’ve got 54.6 cubes of space. That’s not much more than a Kia Soul. Get a Sportage EX or SX, and it will have Kia’s UVO infotainment system with eServices technology, as well as a premium Surround Sound audio system and a dual-zone automatic climate control system with a Clean Air purification system. A navigation system is optional for the EX and standard for the SX. Pair your smartphone to the UVO system, and you can use the voice controls to make calls and access music via Bluetooth. You can download your favorite tracks to the Jukebox, either by streaming them from your smartphone or using a USB flash drive. Satellite radio and Pandora are also ready to rock, meaning that a Sportage owner should have no trouble finding sources of entertainment. 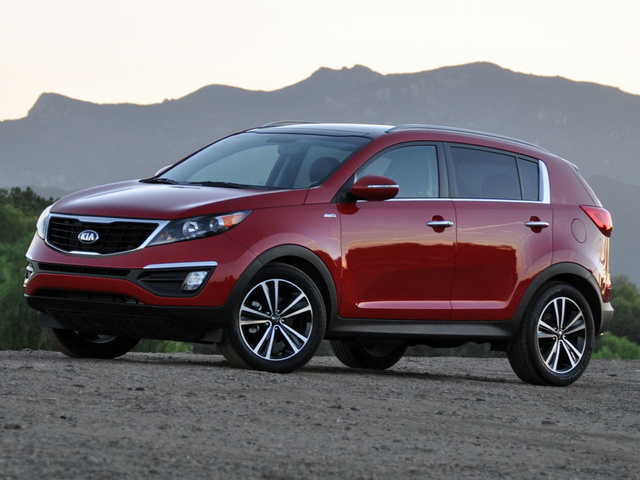 With UVO eServices, Kia supplies a number of subscription-free services for Sportage owners. Using the eServices app and your phone’s GPS, a Parking Minder will help you find the Sportage in a crowded parking lot. Use Google Maps to find destinations, and send them to the Kia’s navigation for future routing. You can also schedule service appointments and receive both vehicle health reports and maintenance alerts using this technology. In addition to its practicality and entertainment value, the Sportage’s UVO eServices technology supplies a number of safety-related functions. Remember: These features are free. Other car companies frequently require subscriptions for these types of services. For example, as long as a smartphone is connected to the system, a 911 Connect service can automatically contact emergency responders following a collision in which the airbags deploy, thereby speeding rescuers to the scene of the accident. If you’ve got young drivers in the household, UVO eServices allows parents to program speed and curfew alerts, as well as to set geographic boundary alerts. The system also provides easy access to 24-hour roadside assistance, which is good for the first 5 years or 60,000 miles of ownership. In addition to these UVO eServices functions, the Sportage is available with a reversing camera and rear parking-assist sensors. If you’re looking for driver-assistance and collision-avoidance technologies, the Sportage definitely shows its age in this regard, because none are available. That means you cannot get a blind-spot warning system, or rear cross-traffic alerts, or a forward-collision warning system, or automatic emergency braking for a Sportage. Should a collision occur, the Sportage does an excellent job of protecting its occupants except for in one type of crash. 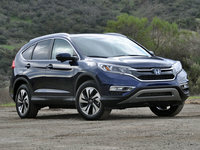 If this compact crossover SUV strikes a tree or a pole or oncoming traffic on the front left corner, the protection rating is Poor, according to the Insurance Institute for Highway Safety (IIHS). This Poor rating is, in all honesty, the only reason anyone should eliminate a Sportage from serious consideration. People like bright, shiny objects. Whatever is new, whatever is trending—that’s what's worthy of attention. The Kia Sportage is no longer a bright, shiny object, having been on sale in the current format since the 2011 model year. This stature as yesterday’s news makes it a cost-effective buy. First, it’s been around long enough to prove itself reliable, according to J.D. Power and Consumer Reports. Second, Kia dealers are always ready to make a deal, especially as the automaker finishes up production in advance of the redesigned 2017 Sportage’s arrival. Third, let’s not forget that every Kia comes with one of the most comprehensive warranty and roadside-assistance programs available from any car company. Nevertheless, ALG thinks the Sportage will do an average job of holding its value over time. 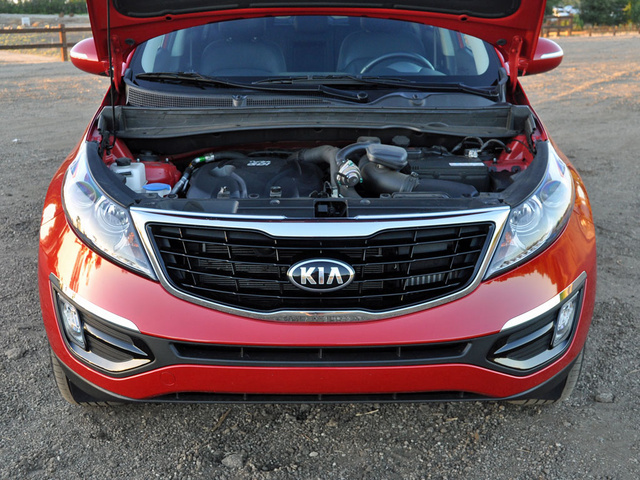 The Sportage SX model’s turbocharged engine isn’t very fuel efficient, either, which is the price to be paid for all that horsepower and torque. Neither trait causes the Sportage to lose my recommendation, though. Rather, it is that Poor crash-test rating that forces me to suggest that perhaps you might be better off choosing a compact crossover SUV that provides greater driver protection in a collision. 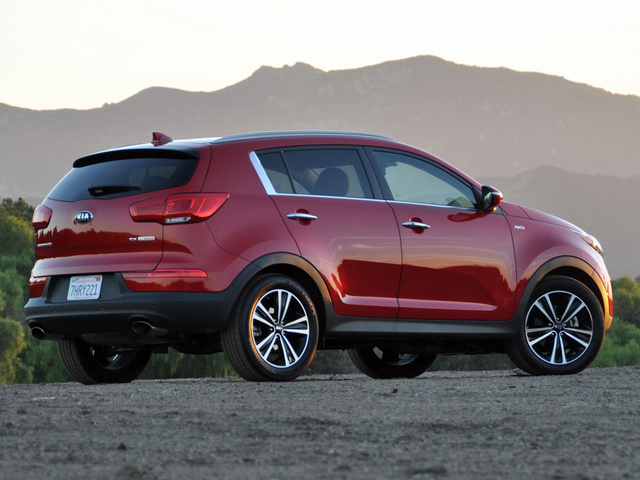 What's your take on the 2015 Kia Sportage? NissanNightmare I used to have a 2015 Sportage. I loved it. I wouldn't mind getting another one. If I can find one for a good price in good condition. 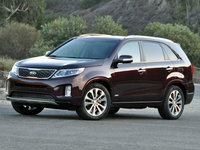 Users ranked 2015 Kia Sportage against other cars which they drove/owned. Each ranking was based on 9 categories. Here is the summary of top rankings. 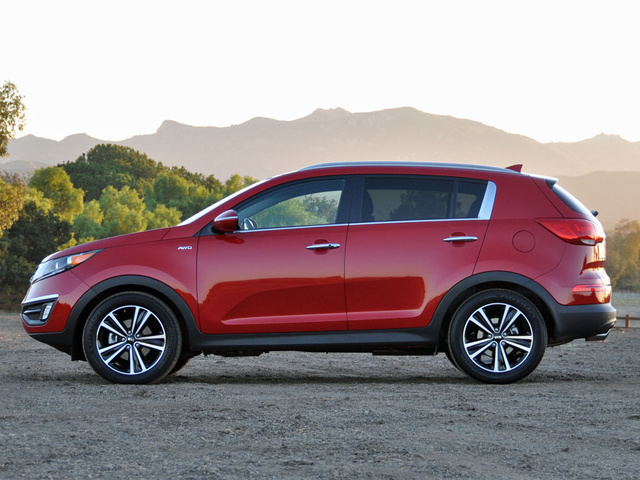 Have you driven a 2015 Kia Sportage? I am having trouble reconnecting my Samsung s7 to bluetooth in kia sportage after 2 years away. It used to work but now does not. What are these flaps in front of the rear tires for and what are they called?